Cracks in concrete are fairly common in the construction industry and sometimes unavoidable. There are as many causes of concrete cracks as there are methods to repair or prevent them. Each type of crack has to be addressed and handled individually. The owners need only to understand that not all cracks affect the structural integrity of the roof and the building, although they may be visually unappealing. In these instances, the owners could address the issue on their own using commercially-available products. One of the most widely-used roofing repair products is the Gardner Gibson 6230-9-34 Black Jack All Weather Roof Cement. Black Jack is an asphalt-based patching compound designed to fix cracks, holes and seams in roofing materials. It effectively seals cracks and holes and creates a waterproof protective layer on top. The all-weather cement is used by applying it on the roof around chimneys, vents, skylights, exhaust pipes and valley. Black Jack’s versatility is proven by its suitability for new construction such as setting flashings, roof material edges and drip edges. Its applications extend to being used as underground damp proofer and water proofer. 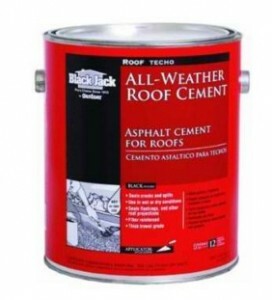 A gallon of Black Jack roof cement can cover a roof area of 12 square feet when applied around 1/8-inch thick. For small and narrow cracks, just apply the product over the surface and force the cement between the cracks while trowelling. For repairing cracks on a larger area, supplementing with a strip of reinforcing fabric is recommended to improve the effectiveness of the product. After application on the roof, the cement gradually stiffens up and cures through time for that weatherproof coat. Since a can of Black Jack covers a relatively large area of the roof, you just have to reseal the can tightly after each session to preserve its consistency for future application. This all-weather roof cement cannot be painted or used with brush but applied on the surface using a trowel. Customer feedback consistently found the product to work as marketed. Those who bought and tried Black Jack note that it has the right consistency out of the can for easy trowelling. Others though had to immerse the can in hot water for around 30 minutes to warm the cement before applying it on the roof using a trowel. The mixture does not drip run while being applied, therefore avoiding a messy experience during application.